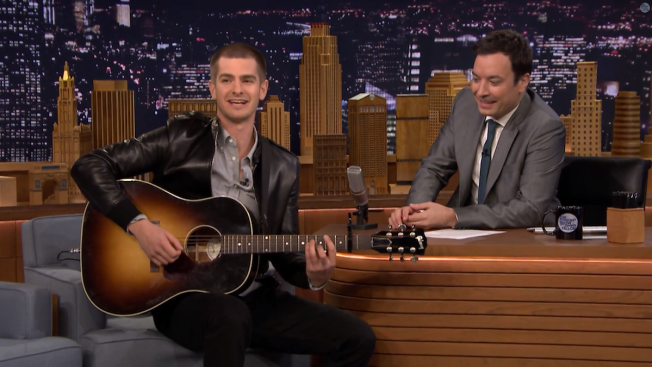 Garfield Plays the Guitar on "The Tonight Show"
Andrew Garfield is getting criticized for saying he's gay, but without the "physical act." Garfield is starring onstage as a gay man with AIDS in a London production of "Angels in America." Britain's Gay Times magazine reports Garfield told the audience at a panel discussion that he's not currently gay, but left open the door for an "awakening" later in his life. He says he prepared for the role by watching episodes of "RuPaul's Drag Race" and added that he's "a gay man right now just without the physical act." Andrew Garfield: The gay community's Rachel Dolezal. #AndrewGarfield made similarly ignorant comments recently as well! Watching RuPaul's Drag race does not make you gay. Hey did you know that if you marathon Drag Race you are a gay man? That's all it takes. Who knew. Thanks, Andrew Garfield. Garfield's representatives didn't immediately return a request for comment Thursday.